Is “tillage” still a four-letter word on the Prairies? The answer depends on who you talk to. General observation suggests more farmers have been using some degree of tillage in recent years. It’s not a landslide movement toward full-tilt conventional tillage, nor the season-long black dirt of summer fallow days, but farmers are looking at various tillage operations to fix certain field problems such as smoothing ruts, managing heavy crop residue, controlling weeds and breaking up compacted soil. while the balance was conventional. land that was tilled but maintained most of the residue on the soil surface while about 16 per cent was tilled to incorporate crop residue. Which way is crop production headed? Prairie farmers are increasingly exposed to educational programs and workshops promoting farming practices that benefit soil health. 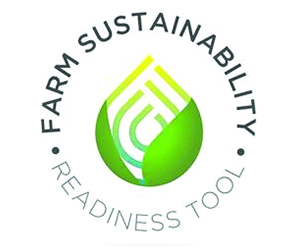 These encourage no-till farming systems as well as soil management techniques that require little to no chemical fertilizer and crop protection products, in part, to lower the cost of production. At the same time, farmers are lining up to observe field demonstrations of the latest tillage equipment. Conservation farming advocates say they hope tillage keeps a low profile and maintains a limited role in crop production. They hate to think marketing programs by machinery manufacturers might encourage farmers to chase increased production by means of what amounts to recreational tillage. Harvey Brink farms near the west-central community of Bentley and was an early adopter of direct seeding. He’s run a mixed farming operation for about 30 years using tillage on a limited basis. “We just returned to a strictly zero-till cropping system,” said Brink, who was one of the founders of the now-defunct Rainy Creek Conservation Club. About four years ago, to spread out farm workload, he began applying nitrogen in the form of anhydrous ammonia after fall harvest or just before spring seeding. “But we found incorporating the anhydrous disturbed the soil too much,” he said. “The seeding system we were using didn’t like disturbed soil, so we stopped using anhydrous.” Brink had been using a Conserva Pak air seeder and more recently switched to a Pillar hybrid disc/hoe air drill, but it also didn’t work well with tilled soil. Brink said both seeding systems are designed to deliver optimum performance—including improved seed bed utilization—as they work through crop residue and undisturbed soil. He added he’s not opposed to tillage in specific situations but doesn’t see the need on a regular basis. He has used a disc and cultivator to work up some “extremely rough” rented land to prepare a proper seed bed for annual cropping. “But once we get a field smoothed out, then it is just managed with direct seeding,” he said. “There’s no need for further tillage after that.” He noted he is fortunate to farm in an area where fields drain well so ruts and standing water aren’t issues. Just west of Red Deer, Larry Van Slyke said while he practices conservation farming as much as possible he does use tillage when necessary. Van Slyke was also a member of the Rainy Creek Conservation Club and a director of the Alberta Conservation Tillage Society. “Zero-till isn’t a religion for me,” said Van Slyke. “I still own and occasionally use an old deep tillage cultivator.” With about one-third of the farm in perennial forages, he said he has been direct seeding his annual grain and oilseed crops since 1998. “But I find there are just certain times and situations where tillage is needed,” he said. For example, in years when he is converting perennial forages to annual cropping, the land may need light to heavy tillage, depending on pocket gopher activity, to prepare for seeding. Depending on growing season and harvest conditions he may also have to cultivate areas that are rutted or compacted. He said while it’s important to minimize tillage, he appreciates that no-till isn’t always practical. He points to dairy and hog operations where liquid manure must be incorporated and that potato growers need to cultivate to prepare fields for planting. As well, sod farms work the soil between each crop, and some farmers fertilizing with City of Red Deer sewage sludge must incorporate it into the soil. He also noted large farms may need to incorporate fall fertilizer into the soil for logistical reasons. In northeast Alberta, Vermilion area farmer and Lakeland College dean of agriculture Josie Van Lent is another zero-till farmer. With her family, Van Lent operates Staden Farms, a mixed farming operation producing grains, oilseeds, cattle and bison. They have practiced direct seeding as much as possible for more than 30 years. On their family farm they use a disc-type air seeding system that has its pros and cons, said Van Lent. It’s an excellent low-disturbance tool for seeding that minimizes soil moisture losses, but with higher yielding crops it can also be challenging to work through heavy crop residue. Depending on residue amounts they may harrow before seeding to better manage chaff and straw. “With canola, for example, I am not sure if we are getting the highest yields we could with this system,” said Van Lent. “But on the other hand, it is cost efficient and conserves moisture. At the end of the year, it’s not yield, but net revenue that tells the story.” Van Lent said while she realizes interest in tillage has risen, she hasn’t seen any research that supports the value of some of the more aggressive systems. 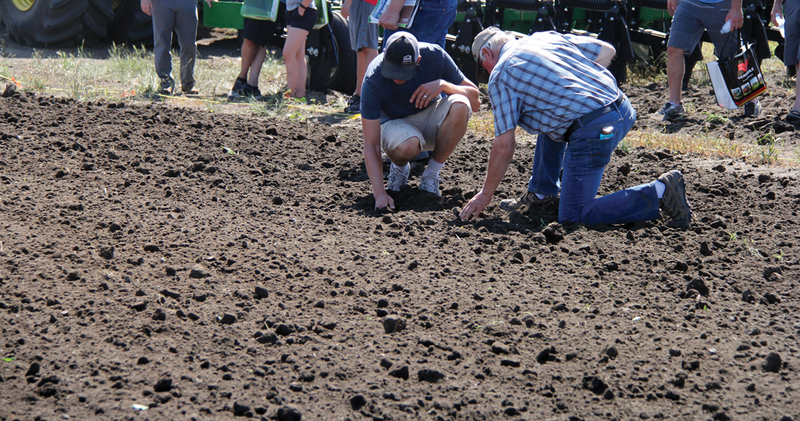 At an equipment demonstration at the Ag in Motion Farm expo in Langham, SK, held this past summer, farmers were quick to assess the degree of soil disturbance produced by tillage tools. 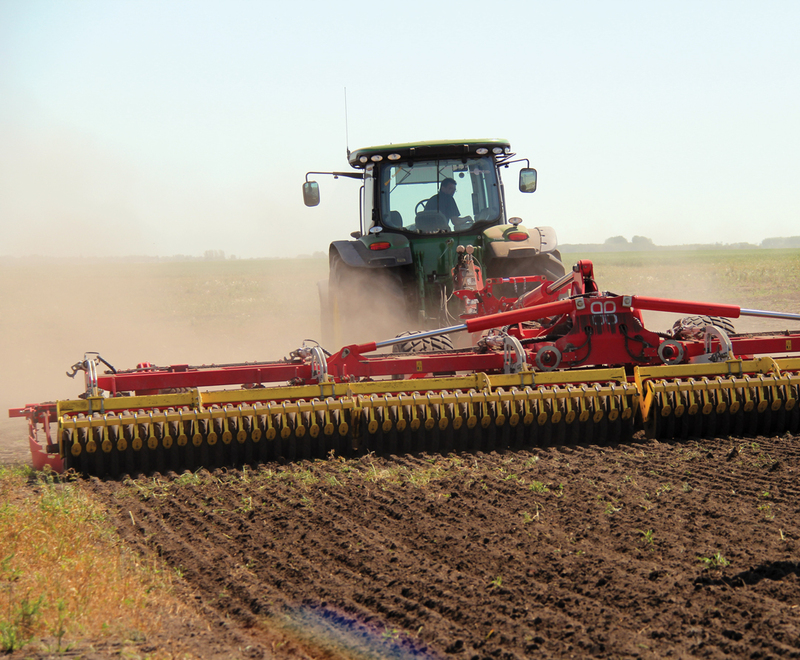 Tillage equipment manufacturers say that as farming practices and weather conditions change in Western Canada, farmers are looking for tillage options to suit. Scott Ousdahl, central Alberta territory manager for Ontario-made Salford equipment, said while no-till farming has many benefits it comeswith drawbacks. 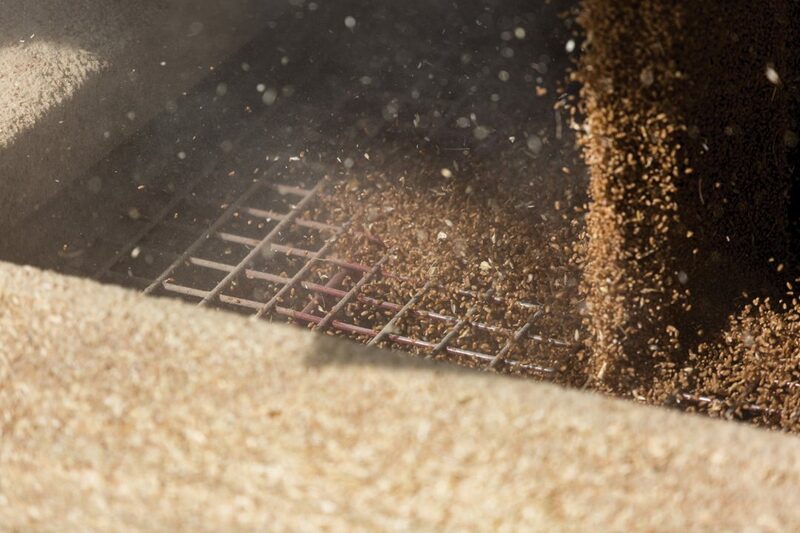 Farmers are producing higher yielding crops that produce more crop residue. It takes longer to break down and keeps the soil cooler—factors that can prevent or delay germination. As well, organic farmers are interested in non-chemical weed control measures. And following wet growing and harvest seasons, all farmers may be faced with ruts and soil compaction. In Saskatchewan, crop consultant Thom Weir said he fears farmers are getting too comfortable with tillage and not appreciating the benefits of conservation farming. A consultant agronomist based in Yorkton, he works with Farmers Edge. He said a few wet growing seasons in Saskatchewan and Manitoba over the past seven or eight years sparked interest in tillage. “The interest seemed to be just about everywhere in Western Canada,” said Weir. “With excessive moisture, farmers turned to tillage to dry out the soil. Some of the companies call their tillage equipment moderate, but they can be very aggressive tools. Alberta soil specialist and crop consultant Elston Solberg said times have changed since the 1980s when the conservation farming effort played a huge role in changing practices and protecting the soil. It’s a new farming era now. While he is not encouraging a return to extensive fencepost-to-fencepost tillage, Charles Geddes, a research scientist with the Agriculture and Agri-Food Canada Lethbridge Research and Development Centre does see its potential weed-control benefits. A specialist in weed ecology and management, Geddes said he sees opportunities for selective and properly timed tillage to control weeds and reduce herbicide use or where herbicide options are limited. “I believe tillage can be effective in dealing with herbicide-resistant weeds,” he explained, using herbicide-resistant kochia as an example. Tillage could be used to control a one- to two-acre patch of the weed before it goes to seed. And since kochia seed only remains viable in the soil for one to two years, repeating the tillage operation on those patches for a couple seasons can eliminate it. In another situation, fall tillage could help reduce weed pressure the following spring. Geddes used the example of following canola in rotation with soybeans. He said a tillage operation after canola is harvested could stimulate growth of volunteer canola as well as other weed seeds in the soil. 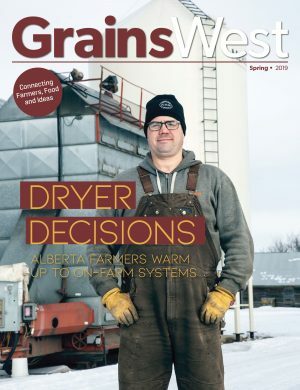 “So, if those weeds start growing in the fall, some may die off over winter and any that do survive will be up and growing in the spring where hopefully they can be controlled with a pre-seeding burn-off herbicide before soybeans are planted,” he said. The take-home message is that while experts suggest there may be uses for discs and cultivators, they agree farmers need to be careful not to make tillage a routine, annual practice. Conservation farming practices in use for the better part of the last three decades deliver well-documented soil and moisture conservation gains, so strategic tillage may be the order of the day.